CHAPEL HILL — June 1, 2011 — For Immediate Release — Talking Baseball With Ed Randall is a DVD collection of intimate and rare, one-on-one interviews with the greatest that Major League Baseball has to offer, including the game's most iconic players, managers and announcers. From Mickey Mantle and Ted Williams to Bob Gibson and Ernie Banks – and dozens of other renowned players from 13 major league teams – this unique anthology celebrates the legends, legacies and heroes of the diamond (on and off the field) that have made baseball America's #1 national pastime in major cities across the country. Featuring select interviews with some of baseball's most extraordinary legends—insightful, compelling and entertaining personal portraits that can only be delivered by a broadcasting pro like Ed Randall. One of the foremost journalists in the history of baseball, Randall is host of Ed Randall's Talking Baseball on New York's WFAN-AM and on Sirius XM Radio's MLB Home Plate channel and hosted a television version of the show for more than 15 years on what later became FOX Sports Network. These memorable interviews, culled from over 500 Randall-hosted broadcasts, are an extraordinary archival library covering more than nine decades, digitally restored and being released for the first time, in any format, since their original broadcasts. Presented in 13 individual team collector's sets, volume #1 of each collection will be available June 7 at a retail price of $14.99 each. Highlighting four to six members of each team's baseball royalty, these special-edition releases will be sold through leading retailers everywhere. Featuring: Tom Glavine, Greg Maddux, Phil Niekro, Del Crandall and David Justice. Real nostalgia is achieved with Del Crandall, a member of the original Boston Braves and Milwaukee Braves before the franchise moved to Atlanta; three 300-game-winning pitchers Tom Glavine and Greg Maddux who pitched together and comprised one of the greatest starting rotations in the history of baseball and legendary knuckleballer Phil Niekro, who, along with his brother, combined to win more games than any other brother combo in baseball history; followed by David Justice, a member of the powerful '90s Braves and World Series champion. Ted The Splendid Splinter Williams (1918 –2002) was arguably the greatest hitter of all time, playing his entire 21-year MLB career as left fielder for the Red Sox. A 19-time All-Star, he was inducted into the Baseball Hall of Fame in 1966. Williams was the last player in Major League Baseball to bat over .400 in a single season. Dom The Little Professor DiMaggio (1917 –2009) also played his entire 11-year baseball career for the Red Sox (1940–1953). His 1948 totals of 503 putouts and 526 total chances stood as AL records for nearly 30 years. The brother of Joe DiMaggio, Dom was overlooked for what many experts considered a Hall of Fame hitting and defensive career. Wade Boggs played much of his career with Boston and was elected to the Red Sox Hall of Fame in 2004 and the Baseball Hall of Fame in 2005. With 12 straight All-Star appearances, Boggs reached the magical and rare milestone of 3000+ hits for a career. Luis Tiant is the legendary pitcher for the '70s Red Sox teams that played in the 1975 World Series. Catcher Jason Varitek has played his entire major league career for the Red Sox and is a member of the team to this day. Varitek is one of only two players in the history of the sport to have played in the World Championship game of the Little League World Series. He played on the 2004 and 2007 World Champion teams. And Roger Clemens, simply one of the greatest pitchers in the history of baseball with over 350 wins and seven Cy Young Awards. Ernie Mr. Cub Banks played his entire 19-year baseball career with the Cubs and is regarded as one of the most popular baseball players in Chicago sports history, elected to the Baseball Hall of Fame in 1977. Harry Caray (1914 –1998) was a legendary broadcaster on radio and television, spending 27 years covering Chicago baseball, the last 16 with the Cubs. Andre The Hawk Dawson was one of baseball's most dangerous hitters and is one of six MLB players with at least 300 home runs and 300 stolen bases during his career. Dawson was inducted into the Baseball Hall of Fame in 2010, winning his only MVP award with the Cubs. Ferguson Jenkins is a Canadian-born, former MLB pitcher. During a 19-year career, he pitched for four different teams, but spent the majority of his career with the Cubs. Jenkins, who also played basketball with the Harlem Globetrotters, was inducted into the Canadian Baseball Hall of Fame in 1987 and in 1991 became the first Canadian ever elected to the Baseball Hall of Fame in Cooperstown. Ron Santo (1940 –2010) was both a great player and long-time radio announcer for the Cubs. A nine-time All-Star in a career that spanned 1960 to 1974, he is one of the most beloved Cub players of all time. Every Reds fan will revel in the interviews of Sparky Anderson (1934 –2010), manager of the Big Red Machine world series champion who dominated the 1970s; Tony Perez, the Hall of Famer who spent 16 years in Cincinnati and was the centerpiece of the great '60s teams and then the Big Red Machine of the 1970s; George Foster, the incredible home run hitter on the Reds teams; and Barry Larkin, the wondrous and beloved shortstop who played all 19 seasons with the Reds, leading them to the 1990 World Series. One of the most beloved broadcasters in the history of the game, Ernie Harwell (1918 –2010), who in 2009 was named to the American Sportscasters Association list of "Top-50 Sportscasters of All Time," provides memorable interview commentary with Ed Randall. For over 40 years (1960 – 2002), Harwell was the Voice of the Tigers before Detroit fans lost one of their most beloved heroes. Sparky Anderson earned his nickname for his boisterous behavior toward umpires as a minor league player. He managed the Tigers for 17 years, including the 1984 World Champions (the last year the Tigers won a World Series). Named to the Baseball Hall of Fame in 2000, Anderson was also the manager of the legendary '60s-70s Big Red Machine in Cincinnati, winning two World Series Championships. Jack Morris, who played with the Tigers for 14 seasons, was armed with a fastball, slider, devastating splitter and a fierce competitive spirit. A five-time All-Star who played on four World Championship teams, Morris started the most games, pitched the most innings and was the winningest pitcher of the decade. One of the most hard-nosed competitors of his time, Morris led the Tigers to the 1984 World Series Championship. Travis Fryman took second to none in his coverage of third base for the Tigers for seven seasons. An underrated player and a terrific hitter, Fryman anchored an infield along with legendary and lifetime Tiger players Lou Whittaker (2B) and Alan Trammell (SS). This very special set features legendary base-stealing shortstop and member of the great '60s championship teams Maury Wills; one of the centerpieces of the great championship teams of the '70s and '80s, Dusty Baker; legendary home run hitter Frank Howard; Johnny Podres, a vital member of the great Brooklyn Dodger teams of the '50s, the great 1955 World Championship team, and then a member of the great '60s L.A. Dodger championship teams; Hall of Fame pitcher Don Sutton, who spent 16 years with the Dodgers and who was a part of the '60s and '70s championship teams; and Ralph Branca, the legendary Dodger pitcher, who threw the famous home run pitch to Giants outfielder Bobby Thomson (who joins Branca on air) who sent the Giants over the Dodgers in one of the greatest games ever played, the 1951 final playoff game. With Hall of Famer Rod Carew, a member of the 3,000-hit club, Carew batted over .300 for 15 consecutive seasons and has the third-highest single season batting average (.388) over the past 70 years; Tony Oliva, the beloved player who spent his entire 15-year career with the Twins, leading them to the 1965 world series, was Rookie of The Year in 1964 and had a lifetime batting average over .300; Tom Kelly, the mastermind manager who led the Twins to two World Series championships ('87 and '91) and the Hall of Fame and legendary home-run hitter Harmon Killebrew, a member of the 500 home run club and one of the games most feared sluggers. This collection is a treasure trove of Mets heroes, including one of the greatest pitchers of all time Tom Seaver. Known as Tom Terrific during a 20-year career, Seaver compiled 311 wins and 3,640 strikeouts. In 1992, he was inducted into the National Baseball Hall of Fame by the highest percentage ever recorded (98.8%) and has the distinction of being the only plaque at Cooperstown wearing a New York Mets cap. Keith Hernandez, one of the best fielding first basemen in history, played so aggressively at first base that he occasionally discouraged opponents to bunt merely by reputation. It was only when Hernandez was traded to the Mets in 1984 that the team almost instantly transformed into winners, taking the World Series title just two years later. The broadcasts of Bob Murphy (1924 – 2004) were known for his optimistic outlook. Murphy was with the Mets from their inception in 1962 until his retirement in 2003. He was inducted into the Baseball Hall of Fame in 1994. Ron Darling spent 13 years with the Mets and was a starting pitcher on the fabled 1986 championship team, currently works as a commentator for national baseball coverage on TBS as well as for the Mets. Ralph Kiner, a legendary former MLB player, has been an announcer for the Mets since the team's inception in 1962. Kiner's tremendous slugging outpaced nearly all of his National League contemporaries between 1946 and 1954 and he was elected to the Baseball Hall of Fame in 1975. Howard Johnson is third on the Mets' all-time list for home runs, runs batted in, doubles and stolen bases. Known as Hojo, Johnson was a cornerstone during the Met's revival years in the 1980s and was a key member of the '86 championship team. Featuring the greatest Yankee pitcher of all time, Hall of Famer Whitey Ford. Ford played his entire 18-year career in a Yankees uniform and is arguably the greatest World Series pitcher in history. Another beloved player and announcer who spent his entire 13-year playing career and 40-year announcing career with the Yankees, was legendary shortstop Phil The Scooter Rizzuto (1917 – 2007). Considered by many the most valuable player of all on a team of greats, he was elected to the National Baseball Hall of Fame in 1994. Lawrence Yogi Berra is another legendary player who played most of his 19-year career for the Yankees. One of only four players to be named the MVP of the American League three times and one of only six managers to lead both American and National League teams to the World Series (Yanks and Mets), he was elected to the baseball Hall of Fame in 1972. Under-rated Clete Boyer (1937 –2007) was the third baseman on, arguably, the greatest baseball team ever assembled: The 1961 team with Mickey Mantle, Roger Maris, Elston Howard, Yogi Berra, Tony Kubek, Bobby Richardson and Moose Skowron. Center fielder Joe Pepitone, who enjoyed a seven-year run with the Yankees, was one of baseball's biggest characters who liked to live large in his personal life. Mickey Mantle (1931 –1995), one of baseball's most legendary players on any team – and to this day the only player to come close to hitting a ball out of Yankee Stadium – was another Yankee career only player. 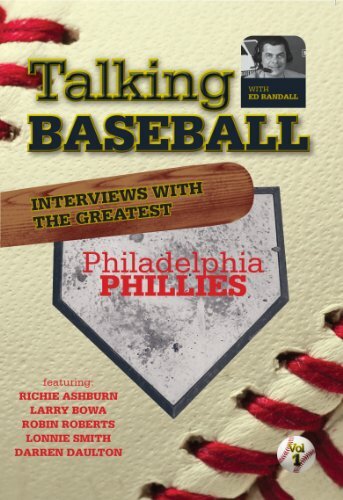 First up is the lead off hitting Hall of Famer and one of the most beloved figures in Philadelphia sports history, Richie Ashburn, a member of The Whiz Kids of 1950 and a longtime broadcaster for three decades; Larry Bowa, the feisty shortstop of the powerhouse Phillie teams of the '70s and World Series champions in 1980; Robin Roberts, Hall of Fame pitcher who spent 14 seasons with the Phillies and was a member of the 1950 Whiz Kids; Lonnie Smith, a slick hitting and fielding member of the 1980 World Series champions; and 14-year Phillie catcher Darren Daulton. Interviews with cult character Dock Ellis, who famously threw a no-hitter while admitting to be high on LSD; the legendary Hall of Famer Ralph Kiner, who set home run records galore; Jim Leyland, brilliant manager of the powerhouse '80s and '90s teams; the beloved Willie Pops Stargell, the Hall of Fame great who spent his entire 21-year career with Pittsburgh and led the We are Family 1979 team to a World Series championship; Chuck Tanner, the manager for 10 years and leader of the 1979 World Series champs; and Bill Virdon, who served as both a manager for the Pirates and a beloved player for 10 seasons, including the 1960 world champion team that shocked the Yankees and the world in the bottom of the ninth in game seven. Starting off with Will Clark, who led the Giants to a world series appearance, legends fill out this set with Hall of Famer Orlando Cepeda; Hall of Famer and one of the greatest pitchers in the history of the game, Juan Marichal; and Bobby Thomson – joined by legendary Dodger pitcher Ralph Branca – who talk about Thomson's famous game-ending home run in 1951, one of the greatest moments in Giants' – and baseball – history. This set is a St. Louis fan's dream come true. Legendary Hall of Fame shortstop Ozzie Smith, who spent 15 years with the Cardinals, taking them to three World Series and playing his position so brilliantly that he was known as The Wizard of Oz; Hall of Fame pitcher Bob Gibson, who is considered one of the greatest pitchers of all time; borderline Hall of Fame catcher Ted Simmons; and the legendary Curt Flood, a major factor and great player on the '60s championship teams who challenged baseball free agency rules in 1969 and was effectively (and sadly) run out of baseball.